My friend Chip Bell is THE go-to-guy when you need a speaker on the Customer Experience. I’m delighted he’s agreed to write an article for us on taking care of customers effectively and with integrity. In case you don’t know Chip, he’s the author of 20 (count em) books on how to make customers for life (my favorite is Wired and Dangerous: how your customers have changed and what to do about it but he tells me his latest book The 9½ Principles of Innovative Service is equally terrific). Enjoy this terrific article. His contact details are at the end. Confession, they tell us, is good for the soul. So, here’s one of me mine. When I was ten years old, I did a very naughty thing on Easter. I secretly watched my parents hide the Easter eggs. As my cousins and siblings excitedly rushed into our backyard on the hunt, I calmly went straight to all the hiding spots! I “found” a lot more eggs! But, they had a lot more fun. They squealed and grinned when they found an Easter egg; I was far less enthused. Customer service for many years had more than its share of “squeals and grins.” My hometown grocer would give my brother, sister and me a free fireball when my parents were there to buy groceries. Fireballs were a super popular cinnamon flavored hard candy that turned your mouth red for a while! It was not that long ago the mechanic would repair something he spotted defective when my vehicle was on the rack and fix it without a fee. Today, such generous, unexpected behavior is extremely rare. What has made customer surprise in such a scarcity? Some can be blamed on expense-cutting in the face of ever-diminishing profit margins. Value-added got pricey. Rising customer expectations can be cited as another culprit. After a great customer experience with Amazon, Nordstrom, or Zappos, our grading criteria for an A in service gets raised for every service provider. But, one subtle perpetrator of surprise theft is an organization’s insistence on applying production thinking to customer experience. Making stuff and making memories are substantively different! When you buy a product, you receive a physical object; when you buy a service, you get an outcome plus an experience surrounding that outcome. It is the manufacturer that controls the quality of product-making and all the processes that yield efficiency, not the buyer. Customers don’t show up at the factory to help! The reverse is true for service—the buyer judges the quality of memory making. Since the product-buyer is not a participant in product making, the manufacturer’s focus is largely on the efficiency of internal processes. With service, however, the buyer participates in creating the service experience with the service provider. Consequently, the focus must be on the quality of the relationship. And, in the end, the receiver of a service owns nothing tangible—thus the value of the service depends solely on a satisfactory outcome and a positively memorable experience. The core property of a product is form; the core property of a service is a feeling or emotion. Just as uniformity is a virtue of a product, so uniqueness is a virtue of a service. Six sigma black belts taught the world to eliminate variance in processes so manufacturing could yield greater productivity and thus higher revenue. The service paradigm, while honoring efficiency and frugalness, recognizes the importance of the human dimension and thus focuses on empowered employees able to adjust, adapt and custom-fit the service experience to match the unique requirements of a customer. So, what happens when you apply variance eliminating thinking to the delivery of service experiences? Especially since the very nature of surprise is variance. The most obvious examples are front-line scripts. Remember, “Thank you for shopping at J-Mart, next?” or “Would you like fries with that?” Rather than rely on a consistent pattern—always warmly greet, put a smile in your voice, thank the customer—some organizations require a precise script. Unless the call center operator is a world-class thespian, customers experience robotics instead of authenticity. The memory that is made is so plain vanilla it is essentially no memory at all. Application of affinity programs is another way the management of processes now trumps the leadership of frontline ambassadors. There was a time the front desk clerk or gate attendant made decisions on hotel room or seat upgrades. Now, the computer, with its programmed rule-based fairness, makes the upgrade decision. In fact, in the airport, frequent flyers watch the board to see if they received an upgrade—there is no connection with a person. Consequently, the formerly surprised guest or passenger is today non-plused by the dull procedurally-driven event and the hotel or airline’s quest for an emotional connection that creates customer advocacy is completely lost. Today’s customers expect experiences to be sparkly and glittery with a cherry on top. Meeting the challenge of rising expectations requires rethinking the role of those employees who are face-to-face, ear-to-ear and click-to-click with customers. It means leaders trusting front-line employees to create not just execute. The more they are resourced and freed to be generous and ingenious, the more they bring their high esteem to the service provider-customer co-creation resulting in customers who feel enchanted and eager to tell others. Chip R. Bell is a customer loyalty consultant and the author of several best-selling books. 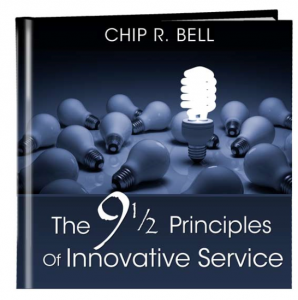 His newest book is The 9½ Principles of Innovative Service (www.simpletruths.com). He can be reached at www.chipbell.com.